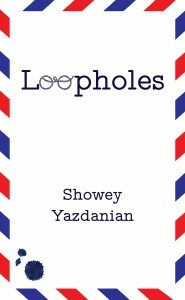 A quick note to say that you can now buy Loopholes directly from the Quattro Books website (author’s note: buying directly from the publisher is generally a more author-friendly way to do things…but feel free to find the book on Amazon or Chapters, it’s all there and they are shipping nicely). 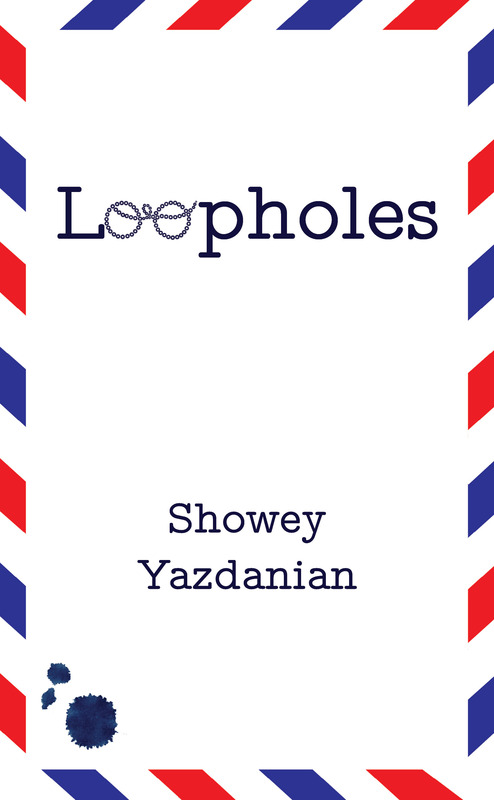 My comic novella Loopholes will be launched tonight at The Supermarket, 268 Augusta Avenue, Toronto. I am immensely excited and it must be admitted somewhat nervous. I should probably also add that on June 23 I will be interviewed on CIUT 89.5 FM and will be reading from Loopholes at The Bookshelf in Guelph on June 20. Next stops: Bangkok, London, Stockholm, Paris and Svarlbard, Norway….IN MY DREAMS. Wonderful. It’s 6:30 AM and the Athens metro is closed. There is no explanation given as to why: people simply sulk outside the shuttered station gates. We tried running to a different metro station. It was also closed. We had a ferry to catch at 7:30, so we caught a taxi. When the ancient and affable taxi driver learned we were going to Mykonos, he cackled his head off and made some kind of an obscene gesture. I don’t understand why, but it probably has something to do with the fact that Mykonos is the centre of Greek gay life. He was also deeply amused by the concept of a female police officer: ‘MAMZELLE POLIZIA HAHAHAHAHA’. Finally, he gave us a long diatribe about politics in Greek which ended with the pronouncement â€œMerkel Mama, Obama Papaâ€. We make the ferry, which is the approximate size of a planet, with 5 minutes to spare. 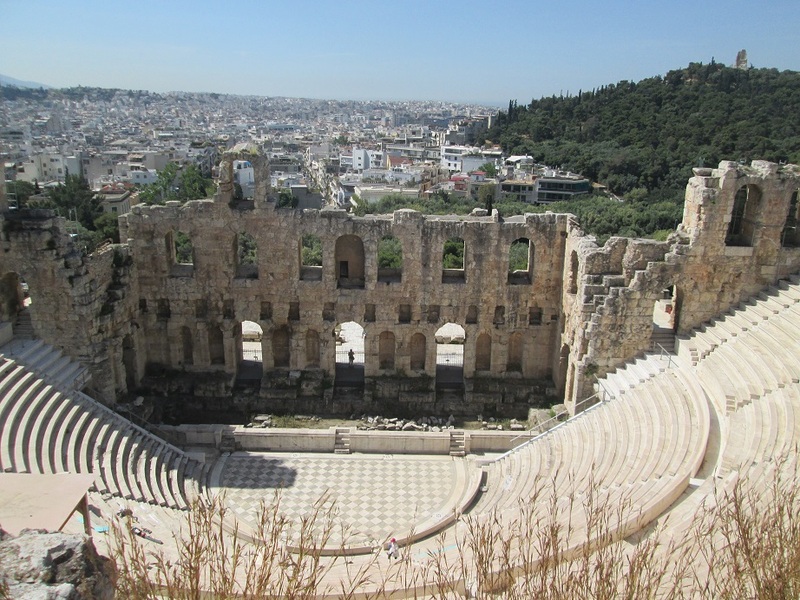 The Theatre of Dionysus at the Acropolis site. 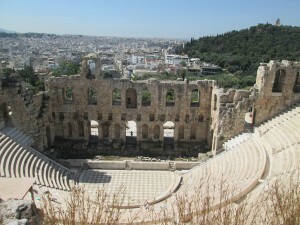 Athens supported a lot of theatres. The Athens airport contains a sophisticated and very pointed jab at the British, and specifically the Greek arch-nemesis, the nefarious Lord Elgin. This jab takes the form of a human-sized computer screen bearing the message “Should the Parthenon Marbles be Returned to Greece?”. Travellers are then invited to vote yes or no, by means of connecting jigsaw pieces which show how perfectly the missing marbles “fit” atop the Parthenon. I tried to vote ‘no’ merely to be irritating, but the program made this very complicated, and probably impossible (I gave up). Anyway, the day after we visited the Acropolis Museum we finally paid a visit to the Acropolis site itself, and you can see the Greeks’ point: they’ve politically sorted themselves out now, the country is stable, the site is immaculate, and there are a lot of conspicuous holes all over the Acropolis where the Elgin marbles should be. The Parthenon is effectively stripped bare, and the Acropolis museum is reduced to displaying a series of pointedly passive-aggressive placards grumbling about Elgin. I would point out, however, that the National Archaeological Museum of Greece houses a spectacular Egyptian collection, which has not been returned to Egypt. 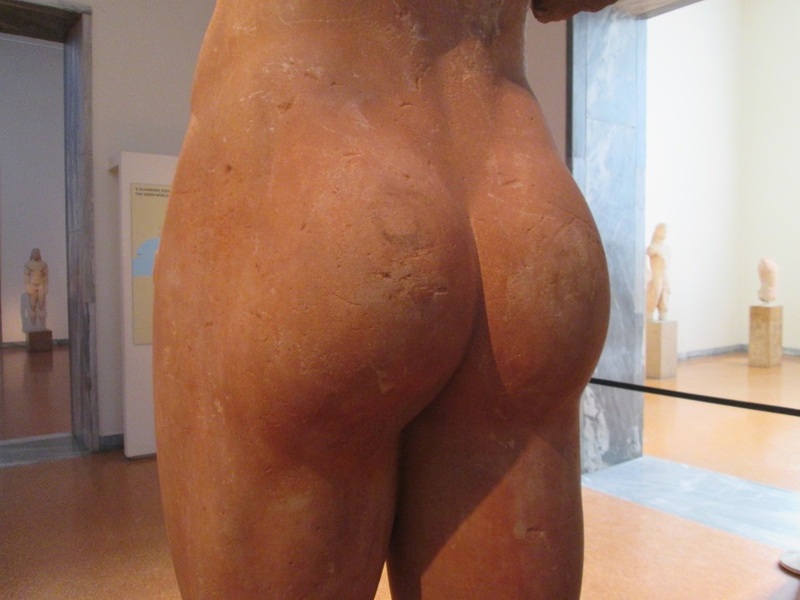 The rear of a statue at the Archaeological museum. Because bottoms are funny. Some would argue that it was the Turks, not Elgin, who really ruined the Parthenon. Greece was under Ottoman control from roughly 1457-1829, and at some point the Turkish garrison thoughtfully stored a large casket of gunpowder right in the Parthenon, because apparently nowhere else would do. One day someone shot a cannon by mistake, the gunpowder ignited, and the rest is history. The Greeks were very displeased by this, but they still reserve their most powerful archaeological hate for Elgin. The Parthenon was also destroyed by the Persians in 479 BC. King Darius was irritated by the Athenians’ support for a rebellion somewhere in Asia minor, so he levelled the entire Acropolis. This was essentially his only victorious battle, however, as the Persians were utterly humiliated everywhere else. The Acropolis aside, we’ve also seen a number of other superb sites: the Temple of Zeus, the ancient Agora, and Hadrian’s library. Athens is essentially one huge pile of rubble, and it can be very confusing because the various eras of rubble overlap. There’s ancient rubble, dating from the glory days of Athens the city-state in the 4th Century B.C., Roman rubble, dating from 88 B.C., when the Romans took over, and finally there is medieval rubble, from Byzantine/Ottoman rule. In practice this means that ancient libraries and pagan temples were knocked down to make room for Roman versions of the same, and then converted into Byzantine churches when Constantine was in power, and then were not infrequently transformed into mosques. Basically, pre-20th century peoples were very good at recycling: instead of demolishing buildings, they simply rearranged the pieces. That said, you can tell Greek rubble from Roman rubble quite easily. The Greeks were great at poetry and culture, but their buildings were quite primitive: they simply took stone and mashed them together. Roman buildings are made of actual bricks, with cement that holds firm to this day. Yes. In terms of construction, Rome>Greece. However, in terms of philosophy, drama, and mathematics, it was Rome that firmly looked to Greece. These days we mostly look to these countries for excellent holidays, but that is neither here nor there. 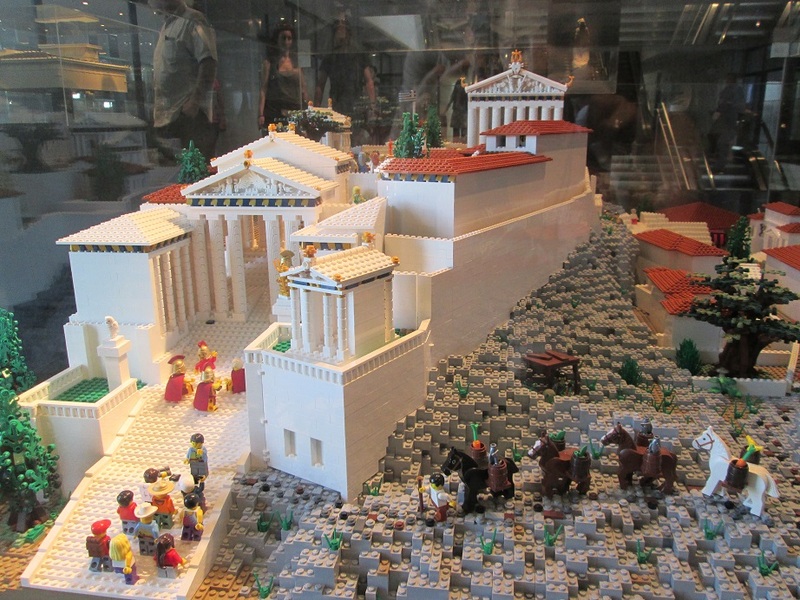 Behold the Acropolis…rendered in Lego. Life-size (not really). The road back to Kastraki from the Meteora was lovely and scenic and full of fragrant trees. We got lost, but did find a man grilling souvlaki on the roadside, who shouted at us until we capitulated and ate some. His wife served fried potatoes and a salad with olives that was superb, and we were only cheated minimally on the bill. We ran around like pointless idiots for a while until a nice gentleman stopped his Mesozoic-era jalopy for long enough to gesticulate at a dirt road through the mountains. His car stalled, but oh happy day: he was right, the improbable path terminated at the rubbish-tip behind our hotel. We made the train to Athens with plenty of time to spare. A beautiful Kore. I didn’t take this picture. I stole it. Much like the British stole a real Kore. The British also nicked one of the six â€œkoraeâ€, which are 2000-year-old immense statues of beautiful women that are used in lieu of regular Doric columns to hold up the â€œEtheulaionâ€, another prize site on the Acropolis. Oh, and one of the korae was accidentally blown up by the Turks: a recurring theme in this tale. 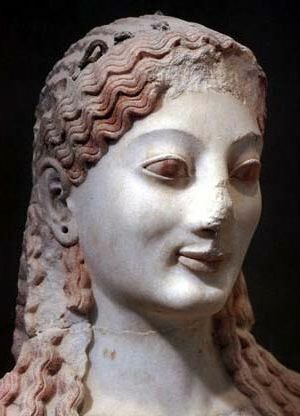 You can view the blown-up beautiful kora, sad and headless, in the Acropolis museum. Look closer. There’s a monastery at the top. How did it get there?? Showey’s adventures in Greece continue! …I took exactly one look at the third monastery and correctly deduced that it was run by women. The place was spotless and daintily decorated with neat, bright gardens of flowers. Also, there was a large sign that read “Rousanou Nunnery”. My final clue was the clutch of enterprising nuns milling about everywhere, selling everything from their famous pine-tree honey to paintings of their monastery on tiny white stones. The nuns keep beehives in the back, smoking out bees in white beekeeping outfits. We bought a jar of honey, which leaked. As with all of the monasteries, it is verboten for women to wear trousers. Rather than booting the shameless trouser-wearing hussies off the mountain headfirst, the Sisters kindly provide skirts, which must be returned at the end of the tour. The fourth and final monastery of my day was Agiou Nikolaou (there are six in total). Nikolaou is accessible by means of a 15-minute vertical climb up narrow a staircase, and most visitors are too pooped by this point to bother with it. Bravely I soldiered on armed with nothing but a cream-cake and a can of Fanta. The highlight of the monastery was an original, completely unrestored 16-century fresco of sinners being subjected to horrible tortures. There are sinners being pierced through the head, sinners being stabbed in the heart, sinners being decapitated â€“ and they all move on a conveyor belt of blood into the jaws of a horrible satanic beast. Jesus Christ floats above them all, smiling beatifically: follow me, children, or terrible tortures await you. The other highlight of the Agiou Nikolaou Monastery was the thoroughly corrupt ticket-master. A millennial Greek, irritable and with a mouth full of chewing gum, he offered me a â€œspecial price discountâ€ of 1 Euro on the 3 Euro fare, but neglected to print me a ticket. In practice this means that he probably pocketed my money, robbing the monks in the process. The only Greek words I know are â€œsouvlakiâ€, â€œPythagorasâ€ and â€œOpa!â€, none of which convey indignation. In closing I will say that the monks seem to be robbed a lot. They should take some lessons from the business-savvy nuns, but probably won’t. The same ticket-master also got volubly irritated when I got bored of my borrowed skirt and removed it. He piously told me to cover my legs. Then he probably went and robbed another monk. The view from the top of the monastery. I feel queasy. The Great Meteoron is the sparkling jewel of the Meteora and was the brainchild of a hermit monk called Athanasios, who diverged from his hermit ways long enough to convince some other hermits to build the monastery along with him. Much of the monastery remains monk-only, but tourists are permitted to visit chapels, the remnants of a 14th century kitchen, two roomfuls of medieval religious manuscripts, and most splendidly of all, a closet full of tidily stacked dead monk skulls. The thousand-year-old manuscripts are incredibly legible and well-preserved, in part because the monks hid some of them in a specially designed crypt during the assaults by the Ottomans. The Meteora were badly bombed during World War II, so one hallway of the monastery is dedicated exclusively to propaganda posters of demonic-looking Germans being beaten up. One depicts a German attempting to raise a Nazi flag, and being kicked down the mountain for his trouble. We moved on to the next monastery: a long vertical climb down, a trek across the mountain pass, and then a long vertical climb up. The Varlaam Monastery has a more modern feel to it, and is somewhat less impressive than the Grand Meteoron. To my mind the most interesting things about this monastery, aside from the obvious fact that 16th century monks hacked it out of a column of stone essentially with their bare knuckles were (a) the biggest 16th century barrel I’ve ever seen, with a capacity of about 12,000 litres and (b) the fact that it is under construction, and mending walls 500 m above ground is evidently a huge bugger. Someone on the ground loads building materials into crates and hoists them up to the hands of a waiting monk via pulleys and ropes. The monk unloads and sends the crate down again. I also found it notable that the monastic ‘guard’ (a civilian non-monk) accepted my 1 Euro coin to light a prayer candle with a gentle, holy smile, and then shoved it in his pocket when he thought I wasn’t looking and slipped a 20 cent piece into the collection box. Blessed be he who robs monks. As with the Grand Meteoron, the gift shop sold unconscionable rubbish. The 14th century golden icon of Jesus was made of plastic, and in China. The Meteora are six medieval monasteries situated on the humps of a peculiar mountain range in Central Greece. They are simultaneously magnificent feats of civil engineering, and an incredibly dumb expenditure of human effort. I will explain shortly. 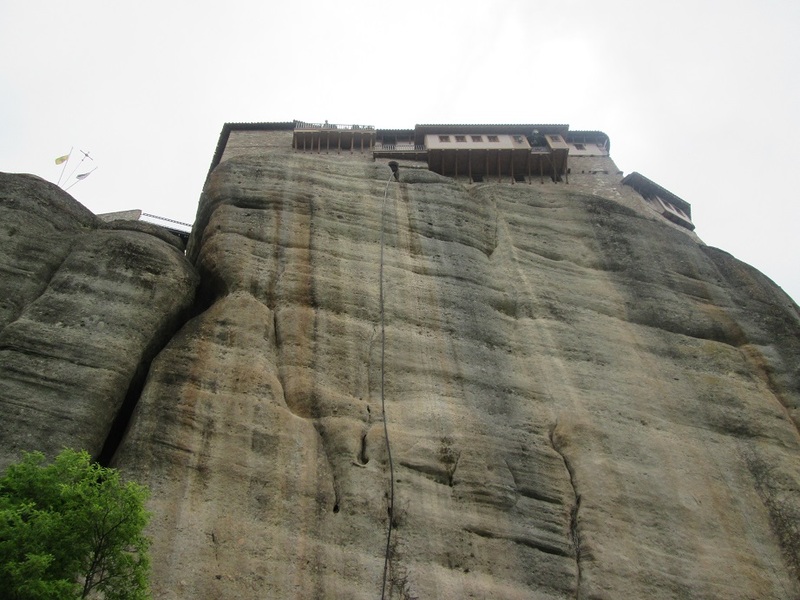 One of the monasteries of the Meteora. I hope this conveys the sheer cheek someone must have had to build this. We took the train from Athens to Kalambaka, from which it is a short ride to the village of Kastraki, where the Meteora are situated. â€œKastrakiâ€ roughly translates to â€œcastrated peopleâ€ in Russian, a fact that is irrelevant but for the zillions of giggling Russian tourists milling about. We stayed at the Hotel Meteora, which offers a spectacular view of the monasteries. It also offers an excellent breakfast, and we ate far too much of it, so instead of hiking the to the Great Meteoron, grandest of all the monasteries at some 600 m above sea level, we opted for a taxi. I felt quite smug as we zipped past the smelly-looking hikers and their backpacks. 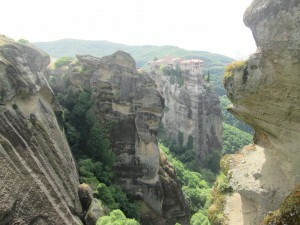 It is difficult to describe the Meteora even when one is looking directly at them. Imagine a low mountain range covered in fresh green grass and sweet-smelling trees and flowers. Now imagine that every five hundred metres or so, an immense pillar of reddish stone the size of the Empire State Building shoots vertically out of the earth, without warning or incline. Finally, plonk a fully operational medieval stone monastery atop each pillar and populate it with a tribe of black-robed Greek Orthodox monks. 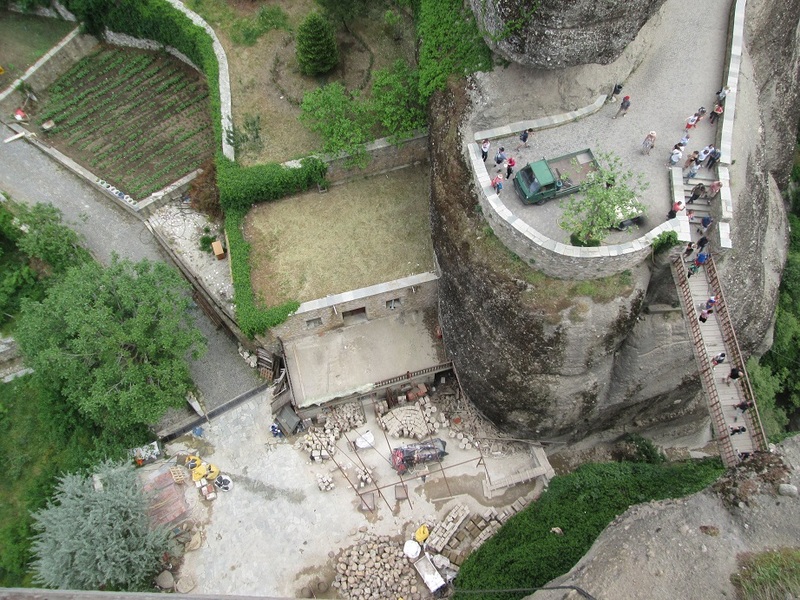 This then is the Meteora, with the important caveat that the engineering which made the unlikely construction possible took place in 1340, before cranes or electricity. Six hundred years later, the Meteora still baffle. How did medieval monks build these immense structures that seem to grow out of the stone like mushrooms? Where did they find water and food? And why in the world did they think that it would be a neat idea to live on columns of stone? Showey’s article appeared in the Globe and Mail on March 3, 2015. Itâ€™s not just the abysmal pay â€“ roughly on the order of $7,500 per course with teaching load varying from two to eight courses a year, usually falling somewhere in the lower middle â€“ or the chronic uncertainty of pay-per-course four-month non-renewable contracts. Itâ€™s that contract faculty, no matter how highly qualified or dedicated they may be, are permanently consigned to the shadows of academia. The job of contract faculty is to slip into the classroom, deliver the prescribed aliquot of education, and then slip out again. They may spend weeks or months creating course materials and teaching strategies, but too often, this knowledge simply vanishes with them as they take up the next dismal temp job and a new cohort of students begins from zero. Needless to say, itâ€™s a singular path. Contract faculty arenâ€™t generally paid to develop or update courses, arenâ€™t usually invited to sit on curriculum committees (or any committees, for that matter). They are mostly excluded from student and campus events unless they participate on a voluntary basis and they have no obvious prospect of career advancement, ever. In the short term, creating what is essentially an academic underclass is probably a neat way to cut costs. In the long run, universities cannot function as vibrant hubs of intellectual activity when they are staffed in large part by a merry-go-round of temporary instructors who sometimes barely know their tenured peers or even each other. At least part of the problem is that universities are torn by competing policy objectives. On one hand, we recognize the value of a well-educated society; postsecondary institutions are swollen with record quantities of students and someone has to teach them. On the other, Canada is in hot pursuit of invention and innovation, and professors who excel at research are often rewarded with â€œteaching releaseâ€ to enable them to produce more of it. More research requires more graduate-level students â€“ but once these bright young things have finished slogging out four to six years of laboratory or field work to gain their PhDs, what fate awaits them? Under the current regime, many are simply plowed directly back into the system as contract faculty, paid peanuts to teach mass quantities of undergraduates. And the cycle perpetuates â€“ the profession feasts on its young. All things considered, the dedication, passion and sheer tenacity of so many contract faculty is remarkable, considering the many ways in which they are basically incentivized not to bother. When you are paid for a minimum number of hours, why not do the minimum amount of work? Why bother reporting academic dishonesty when it takes unpaid time and untold effort? Why bother with interactive classroom technologies when reading PowerPoint slides aloud is just so much easier? Why pour untold hours into supporting troubled students who might reach out with problems ranging from drug addiction to sexual assault? Finally, recall that in the absence of any other markers, contract faculty live and die by the student evaluation. Why bother ensuring that exams are challenging, rigorous and fair when itâ€™s hardly a trade secret that the quickest way to ensure â€œstudent satisfactionâ€ is simply to inflate their grades? The fact is that most contract faculty do bother, and the reason is quite simple: They are genuinely passionate educators. Without this passion to sustain them, most would have quit long ago. To many, the resolution to this is a quick, painful death: Contract teaching should mostly cease to exist. Instructors cannot be treated as dispensable when they are clearly anything but, as evidenced by the fact that York University has been crippled by its strikers, whereas the University of Toronto â€“ itâ€™s still feuding with its teaching assistants but reached a tentative settlement with sessional instructors some weeks ago â€“ remains open. Instead, universities should create a permanent roster of salaried teaching positions, resorting to contract faculty only when desperate. Institutions such as McMaster University and the University of Waterloo have already moved in this direction, having recognized that professors need time, resources and a modicum of security to deliver the continuity, relevance and attention to detail that world-class postsecondary instruction demands. A great education isnâ€™t meted and doled out by the hour, and great educators cannot exist in quarantine from the rest of the academic community. Please stop saying “The Overwhelming Majority of Canadians Support Bill C-51”. The polls don’t support it. A version of this article was published in Now Magazine on March 5 2015. 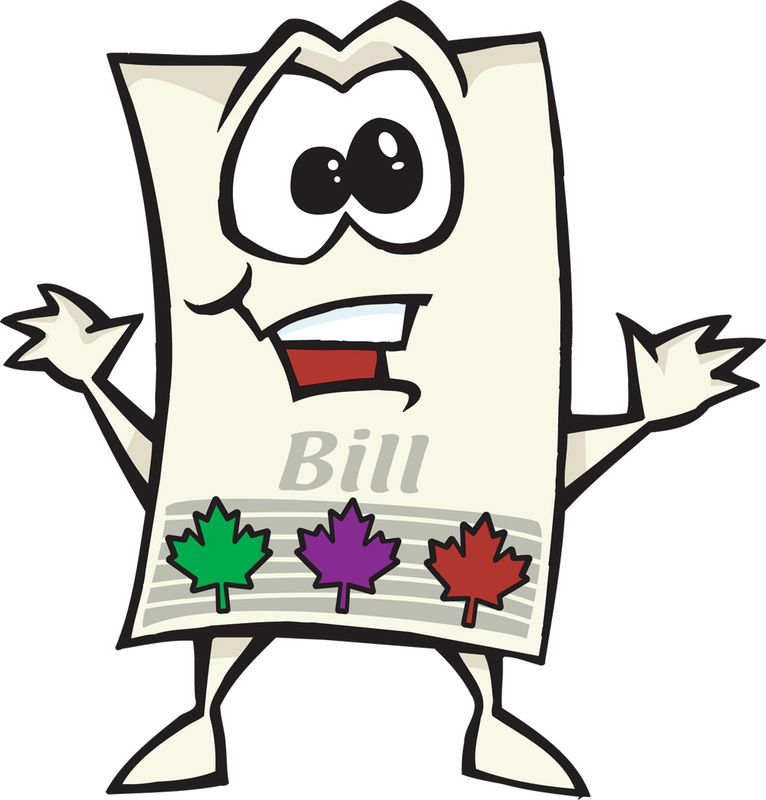 It’s the most controversial piece of legislation in recent Canadian history. And yet, cry some journalists, citing Bill C-51’s apparent 82% national approval rate, there has “rarely been a bill before Parliament that was more popular”. 82%! My, what a large number! When countries like Russia and Iran and Kyrgzstan boast of 95% election turnout rates and 96% presidential approval rates, we in Canada collectively guffaw – a big, hearty, democratic belly laugh at the sheer absurdity of voter unanimity. This isnâ€™t to imply that the Angus Reid poll was fixed or even biased â€“ merely that as a serious assessment of how Canadians really feel about Bill C-51, it just isnâ€™t very good. Still, though â€“ letâ€™s suspend disbelief for a moment and pretend that the survey is a random and representative sample of the real-life opinions of average Canadians. 82% of people is still a lot of people. Itâ€™s even more impressive when you consider that 57% of the total people surveyed openly admitted that not only do they endorse this bill, theyâ€™ve barely even heard of it. More specifically, 855 of the 1509 survey-takers self-characterized their own knowledge of Bill C-51 as either â€œNot read/seen anything at allâ€ or â€œJust scanned/saw the headlinesâ€. To paraphrase: more than half of Canadians who don’t really know what Bill C-51 is think it’s just utterly marvellous. Or do they? 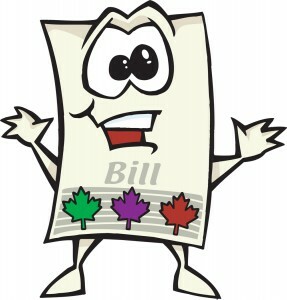 How many Canadians do you know who run around bellowing about Parliamentary bills they haven’t read? I choose (c), â€œIâ€™m not CSIS. Questions about my personal appraisal of the threat of terrorism are irrelevant to the actual content of Bill C-51, so why donâ€™t you take your leading questions elsewhere and ask me something else? In its favour, the poll successfully ascertains that 65 people in Manitoba who go online to complete surveys are indeed worried about terrorism. The numbers in Saskatchewan were somewhat more troubling: in response to the question â€œHow familiar are you with the proposed legislation?â€, 13% of people had â€œread stories about itâ€, 28% had seen â€œa story or twoâ€, 39% had â€œjust scanned the headlinesâ€ and 21% had not read â€œanything at allâ€ â€“ all of which is fine, except the numbers sum to 101%. Mathematics! In sum: media outlets should probably stop citing the Angus Reid poll as hard evidence of Bill C-51â€™s burgeoning popularity. Itâ€™s a free country. If you want to support Bill C-51, then thine is the power. But the idea that this bill is an unstoppable juggernaut, a force of nature with such awesome powers of public approval that itâ€™s simply irresistible at this point is nonsense. This isnâ€™t Facebook. I couldnâ€™t care less how many â€œlikesâ€ Bill C-51 has. I only want to know two things: (a) what itâ€™s about and (b) exactly under what circumstances and how far the government intends to ram its snout into my private life. I suspect most Canadians would agree. 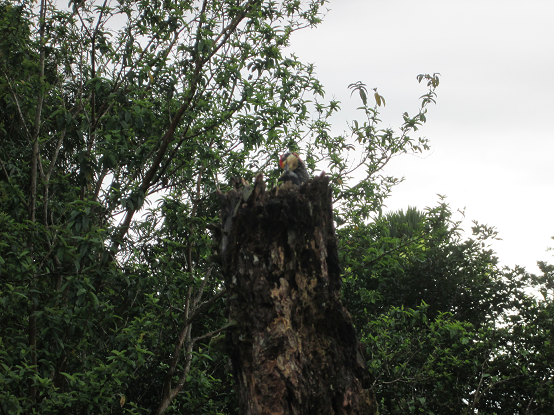 Lovely lovely Costa Rica: sweet sunshine, friendly people, and stunning wildlife. Drive 200 km from dry, hot Guanacaste (36 degrees C) and its famed Pacific coast beaches and its rolling hills dotted with wet-eyed cows give way to a lush wet rainforest (25 degrees C). People are generally inordinately friendly, and the service is easy and relaxed. As for the food, the best one can say for it is that they probably aren’t doing it on purpose. Meals are plentiful but plain. 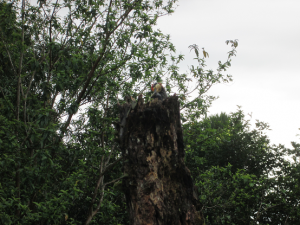 For culinary tours, you should probably repair elsewhere – for eco-tours, spectacular views and endless wonderful weather, Costa Rica is unbeatable. Still Alice actually dates from ~2009 or so, but is newly in the spotlight on account of the film starring Julianne Moore. The book doesn’t show particular promise in the first 50 pages or so, but as Alice’s early-onset Alzheimer’s disease progresses, the story begins to engross. 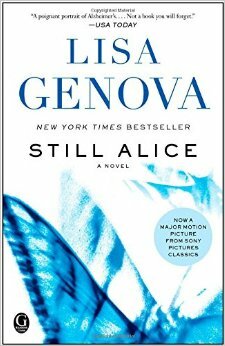 The author Lisa Genova writes the characters with a somewhat heavy hand – that Alice’s relationship with her daughter Lydia is due for a life-affirming transformation is obvious from the first scene – but her writing about the disease is masterful. If Alzheimer’s Disease were a character in this novel, it would steal every scene. One watches with horror and disbelief as Alice’s relationships fade to blank. Before she disappears entirely, Alice wistfully wishes she had cancer instead. Cancer can be “fought”; cancer is a cue for bedside visits and comradely fundraisers. Alzheimer’s can scarcely even be treated, let alone cured, and inspires only pity and embarrassment – difficult emotions which Genova captures deftly. In short the book is a compelling read, and will almost certainly inspire all who read it to revisit their perceptions of those who suffer from Alzheimer’s. …My journey begins in Ottawa after riding the escalator to the tasting floor of the 29th Ottawa Wine & Food Festival at the Ottawa Convention Centre. 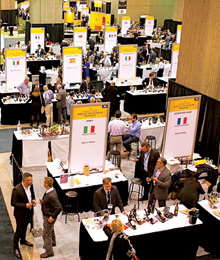 With over 1,400 samples of wines, beers, spirits and foods from around the globe, there are many new tastes, products and people to discover, and itâ€™s hard to find footing in the maze of food and wine exhibitor booths. So I follow the parade of men and women leading the way with tasting glasses in hand. Click to read more. This article, and Showey’s interview with Ann Cavoukian, appeared in Maclean’s Magazine in 2014. Last month eight of the largest technology firms in the U.S., including Google and Apple, sent an open letter to President Obama calling for an overhaul of U.S. privacy laws. And even though Obama has promised new limits on the National Security Agency, revelations about the scale of the governmentâ€™s domestic snooping programs and continued anxiety about over-sharing on social media have focussed a spotlight on privacy issues. For the entrepreneurially-minded, at least, it all adds up to one thing: opportunity. See how Cleese’s mouth is obscured in the picture? That’s an excellent metaphor for the entire book. 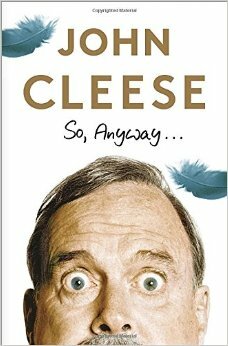 “So Anyway…” is John Cleese’s rather unusual autobiography .Â It’s a basically chronological account of John Cleese’s life, but Cleese bobs and weaves so artfully that it’s nearly the end of the book before one realizes that he hasn’t really revealed very much.Â Cleese has suffered four marriages, but only accounts for one – Connie Booth.Â Cleese and Booth divorced, but you wouldn’t know it from this account – he gives a few sparing details of their courtship, and says nothing of the tension or strain that typically characterizes a divorce (one theory is that the book is meant to be “Volume One” of a series).Â I’m not the first reviewer to point out that Cleese moans and groans rather a lot, and that he appears to have enjoyed precious little of his marvellous success. He reads a little like a slightly frustrated academic – one almost gets the sense that Cleese feels he wasted himself on comedy.Â This is a massive shame.Â Cleese has given me and millions of others immense pleasure over the years – I even had the pleasure of listening to him speak on three occasions at Cornell University, where Cleese was a “Professor-at-Large” for a few years.Â All of this said, I rather enjoyed the book as it went on.Â Cleese is sparing with details about his life, but he is generous with advice to writers and with reflections on the art and practice of comic writing – all of which I found most instructive. fifa 15 coins 200k Â£3 on Please stop saying “The Overwhelming Majority of Canadians Support Bill C-51”. The polls don’t support it.